While writing this, we have left Jerusalem and are now living in the States again. Its been sad for me to look through these photos and remember the amazing experiences we had here and that we are now so. far. away. 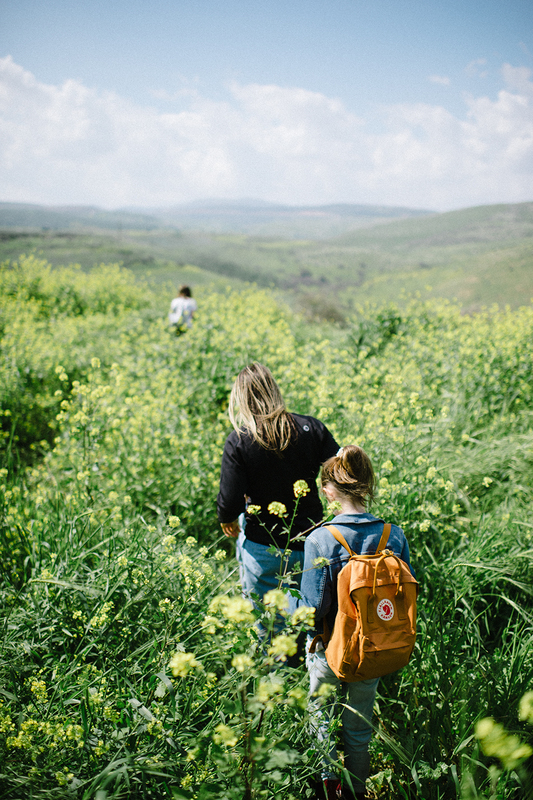 Israel, while it was incredible, was not a place we could see ourselves living long-term and we were feeling ready to come back “home” by the end of our time. That being said, I was also really sad about the end to the last few years of crazy adventures we’ve had (London, Manhattan, Tel Aviv). We’ve learned a TON, grown a TON, spent a TON of time together, and have a TON of fun stamps in our passports and friends that have put a permanent stamp in our hearts. Its been life-changing for us…the good, the bad, the hard, the amazing. All of it. And while I’m sure our time in the US will also be full of many lessons, this has felt different and saying goodbye to it was really hard for me. I hope, more than anything, that our girls will feel the change they’ve experienced by living the way they have (and that will soften the sacrifices each of them have had to make along the way). I love them for how resilient they are and how excited they (usually) are for the next “thing” we get to do, even if it means leaving a life they may have loved behind. This was our last trip to Jerusalem. We knew it would be so we were soaking everything up as much as we could. The feeling, the smells, the people, the noises, the culture, the food, everything. Everything is sharpened at a time like this- when you don’t know the next time you’ll be able to see it all again. Entering through the Jaffa Gate to the market and pausing to take a picture or two before we wound our way through the maze of the old city. So grateful for the lessons we learned here in this holy place. The singular devotion on both sides of this wall and in the entire city is the most memorable feeling for sure. And I’m always glad Brian is there, not only to take pictures, but for his innate sense of direction. We never would have seen corners of this place without him with us. It began to sprinkle a little during our last Come Follow Me lesson near the Garden of Gethsemane. But, we didn’t let it stop us. Also, these horses made it all the more serene and magical to just “be” in the moment. 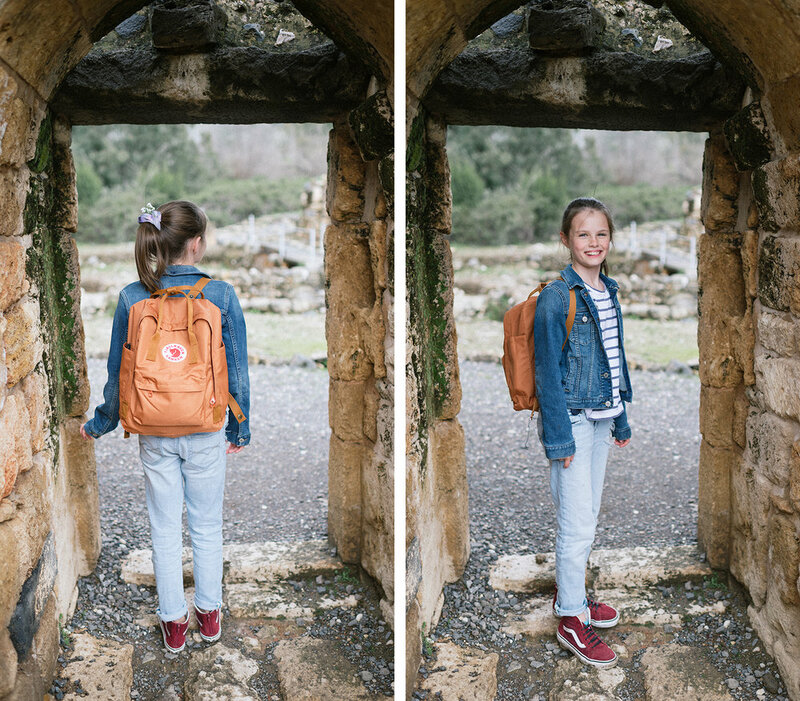 If you asked Brian and I (and hopefully our kids), the thing we will most definitely miss the most is having lessons in these important places. There really is a powerful feeling when you physically are in the place that the scriptures are talking about. 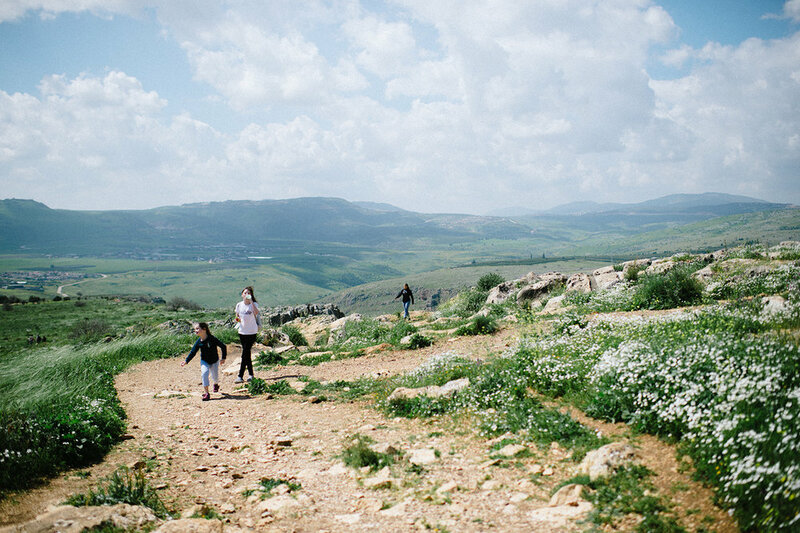 Outside of the first year after Kate’s birth, I have never felt more close to my Savior than living here in Israel. I came to really know Him because we spent so much time talking about and studying His life. It was incredibly life-changing. Brian and I had a chance to spend an entire day in Jerusalem with just the two of us doing things that we have been dying to do. We went to the Israel Museum and specifically the Shrine of the Book, home of the Dead Sea Scrolls. It was incredible and I am SO glad we were able to spend a good amount of time here looking at all of the amazing artifacts. Another favorite was the the Second Temple and old Jerusalem Model. 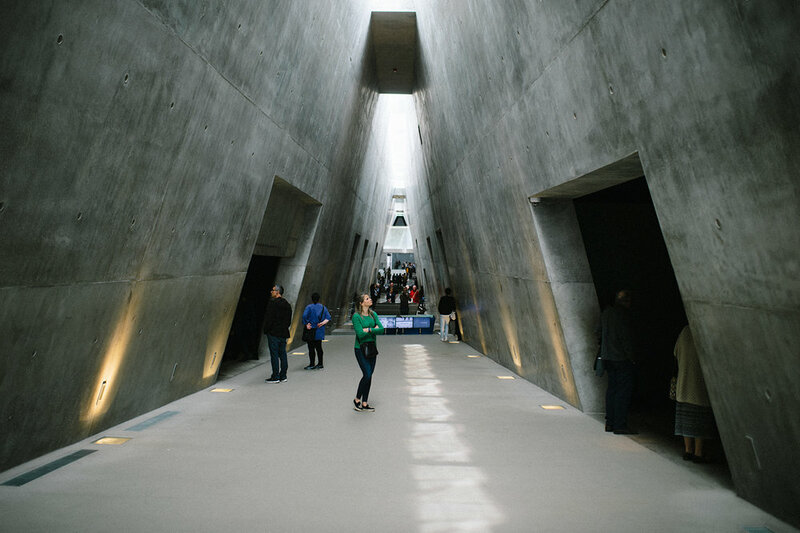 We also made our way to Yad Vashem, the World Holocaust Remembrance Center. I cannot really put into words the magnitude of the feelings and experience encapsulated in this place. Suffice it to say, it needs to be on every Holy Land visit. Here are some pictures below of the outside (which was beyond spectacular) as well as the inside. Two quotes inside that stuck out to me were: “A country is not just what it does- it is also what it tolerates”. (Kurt Tucholsky) “I do not know what a Jew is, we only know what human beings are” (Pastor Andre Trocme). That last quote was a in a massive room dedicated to non-Jews who risked their lives to stand up for and often illegally harbor Jews and this pastor was among those who did just that. I was struck with his outright boldness and courage to do what would have surely been incredibly risky. Would I have done the same? Do I find myself thinking the same sentiment about those who are not like me today? I want to be more like Pastor Andre. Some of the displays are just heart-wrenching. Like this one below. It’s a model of the gas chambers and how they operated and I won’t go into detail here, but it just made my heart sink with the sadness of it all. 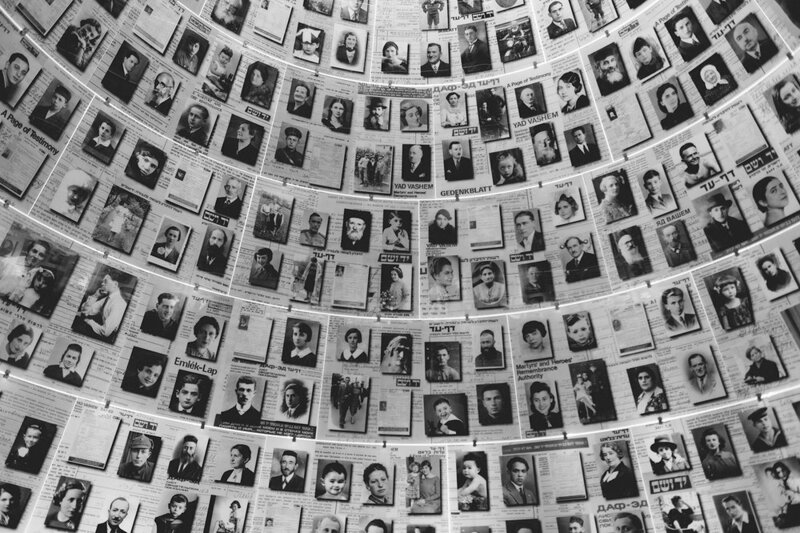 And then you finish here, where they have tried to gather and memorialize all of the victims by name. They all will have a place here in this amazing memorial and no one will be forgotten. 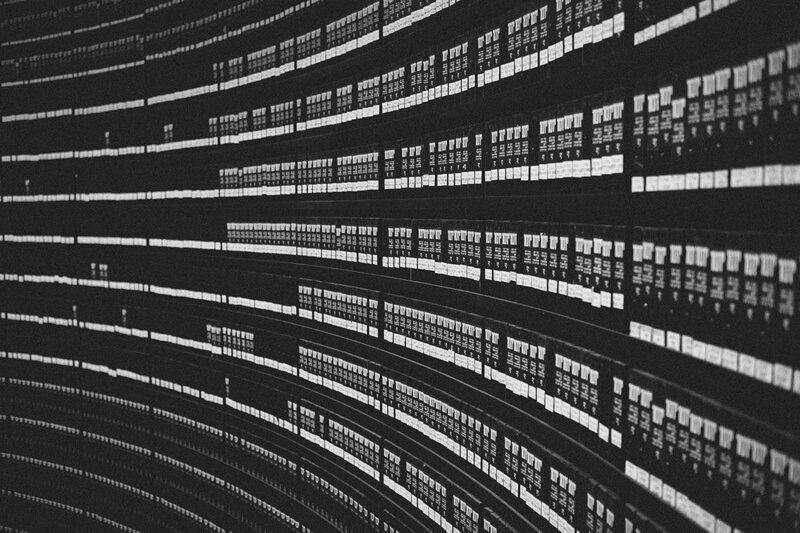 The structure itself is brilliant- so beautifully and thoughtfully designed. 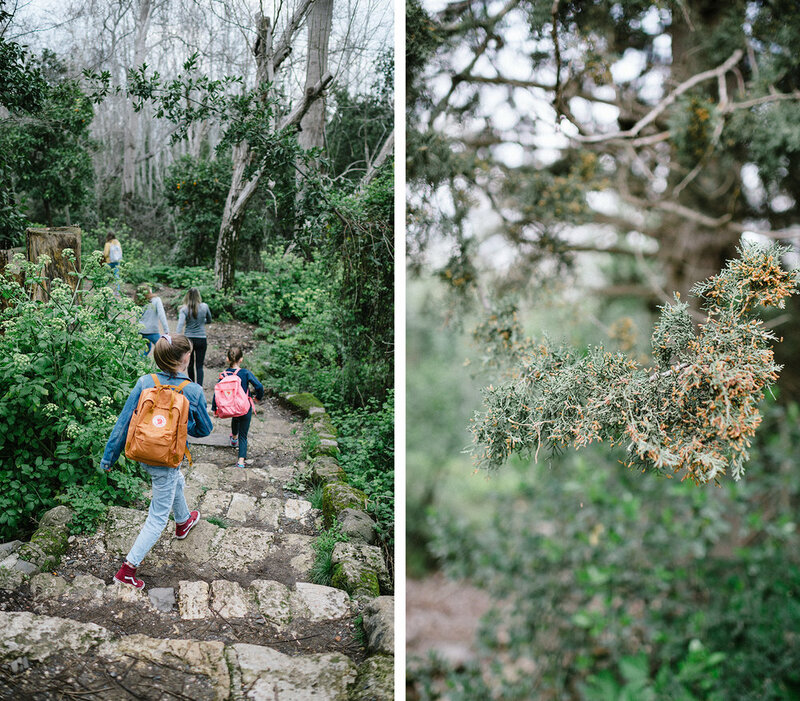 Yad Vashem is surrounded by incredible green hillsides and gardens and the museum designs take full advantage of the views. It adds to the reverent serenity of remembering this dark time in our world’s history. And then…and then..there’s this. 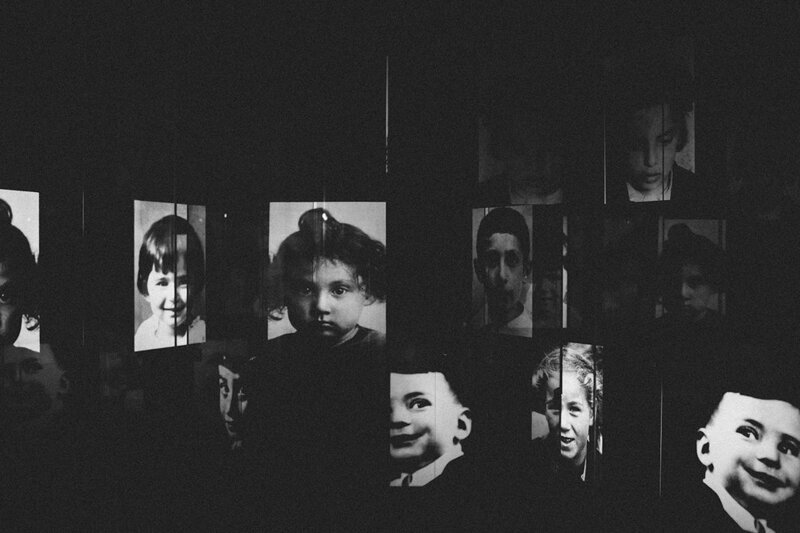 The Children’s Memorial. My heart almost burst with the sadness of the 1 million children who died in the Holocaust enshrined here with 1 million lights. I don’t want to give away too much, but I don’t recall ever being so touched by a memorial in my life. Please make time to find this and go here. Oh, Israel…you really are amazing. 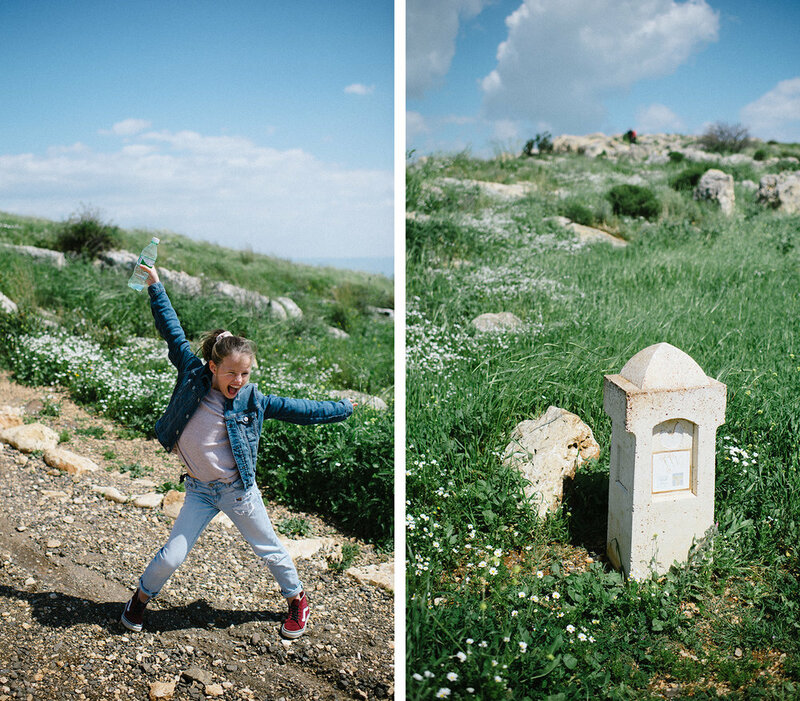 Here are some pictures from our last few days in Israel. There is this kosher American comfort food restaurant called Crave in Jerusalem near the Mahane Yehuda market. We stopped in for kosher bacon cheeseburgers (fake cheese, lamb bacon etc) which were actually pretty good and hugely popular. We made a last run through our own Carmel Market in Tel Aviv for our favorite meals. Shmuel for their beef and lamb pitas and Ning Thai for their noodles. I didn’t love tahini before we moved here, but now its just something that you cannot be without. It’s like America and their peanut butter. They find a way to put it in and on everything and these beef and lamb kebabs are just the perfect dish when smothered in its goodness. Mouth-watering food that I will miss (above from Shmuel). We also spent a few hours walking around old Jaffa’s market and shops. I love this place and how eclectic it is. We all rented Bird scooters to get to and from Jaffa this time. Brian took Tessa, I had Lauren and Kate and Taylor doubled up. We laughed the whole way and had fun riding along the coast to get to Jaffa and then back home. The scooters were really fun and literally everywhere (we rode them a ton) and made getting around the city easy. Another really fun “last” that I’m so glad we scheduled in. After hearing so many good things about this hike up Mt. 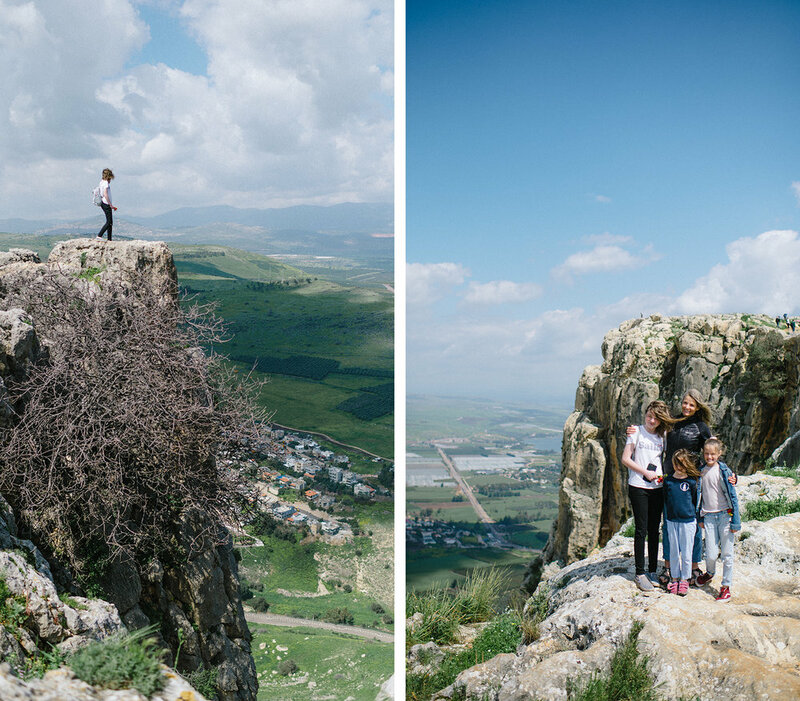 Arbel, we knew we wanted it on our Israel bucket list. 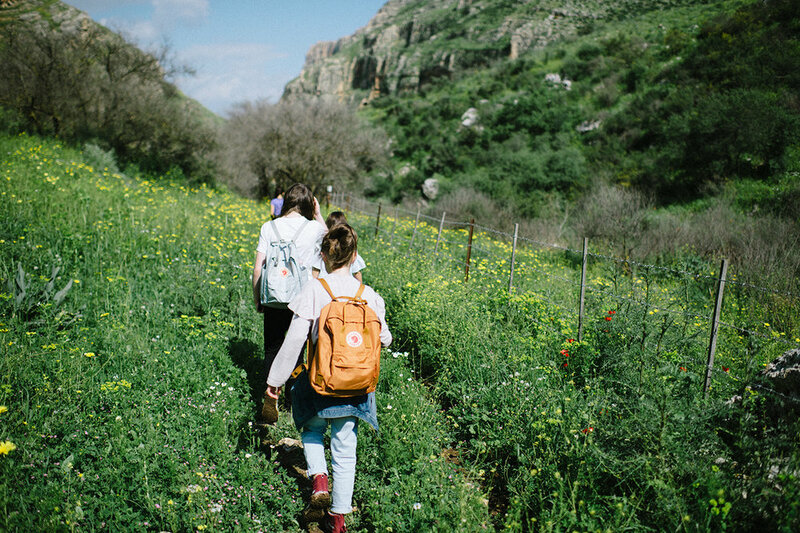 A couple of weeks before we moved away, we made the drive up to the Sea of Galilee with our friends, The Mayberry’s, to cross this one off. Mt. 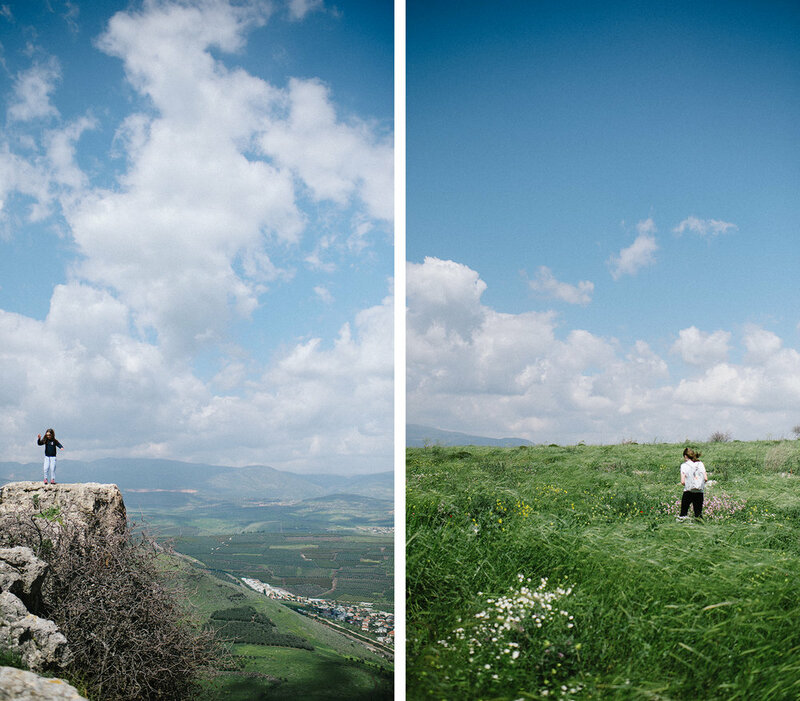 Arbel sits high in the lower Galilee area and on a clear day you can see all the way to Mount Hermon in the Golan Heights. 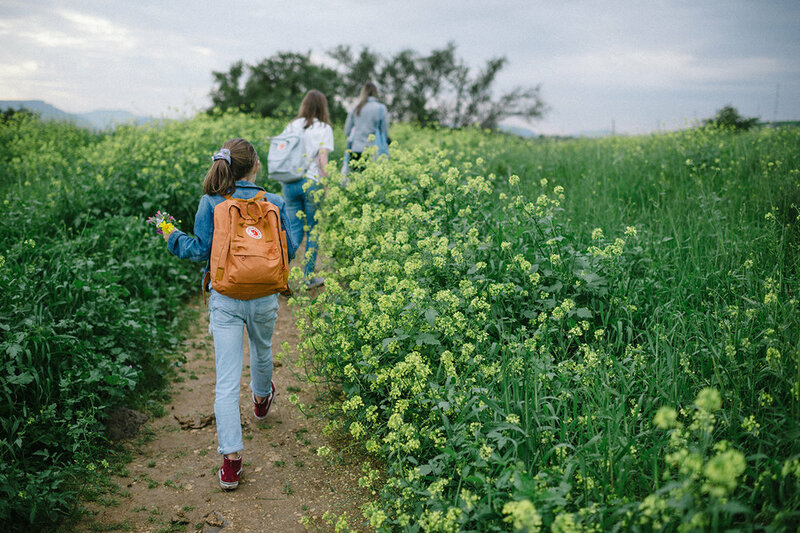 This time of year provides not only stunning views, but everything is swathed in green and colorful wildflowers, and the weather is as perfect as it gets. Mt. 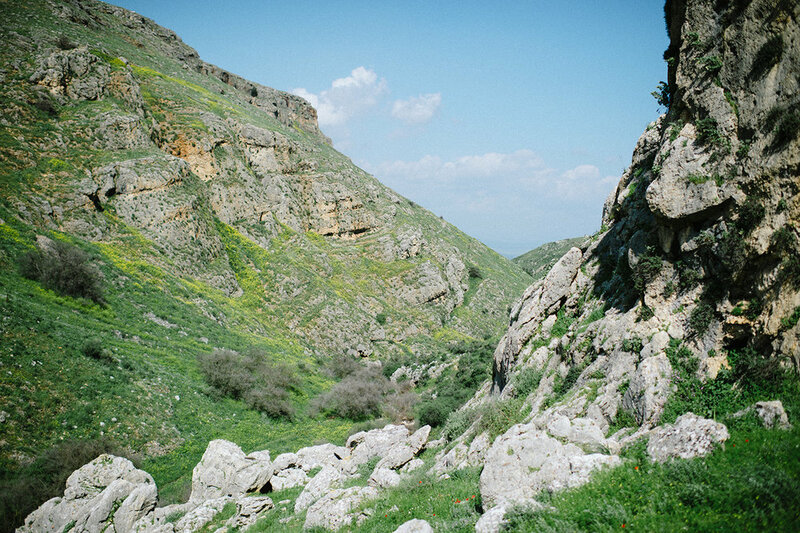 Arbel overlooks the Sea of Galilee as well as the Jesus Trail, which is where many believed Jesus may have walked between Capernaum and Nazareth. Cannot get over how beautiful this place is. Also, it was an extremely windy day at the top (laughing at Tessa in the above pic with her hairy smile) because a storm had rolled in the night before, which also closed many of the main trails. 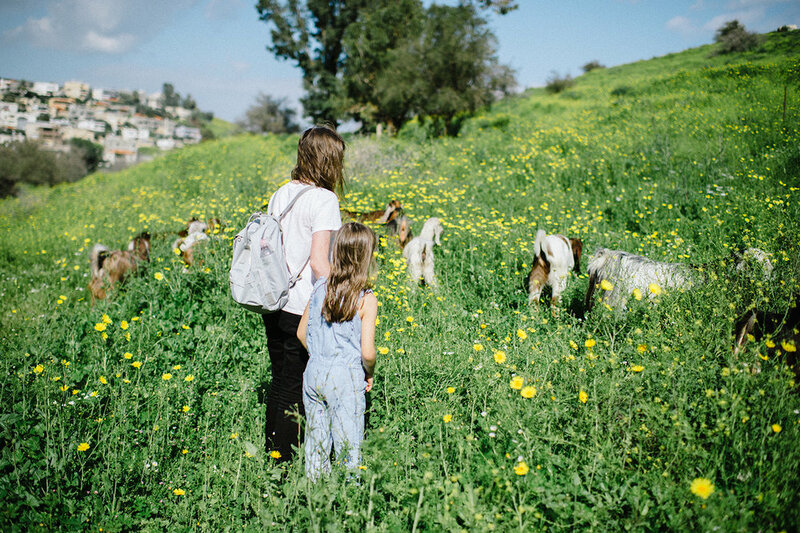 I never would have guess that Israel was this green and lush…so gorgeous. 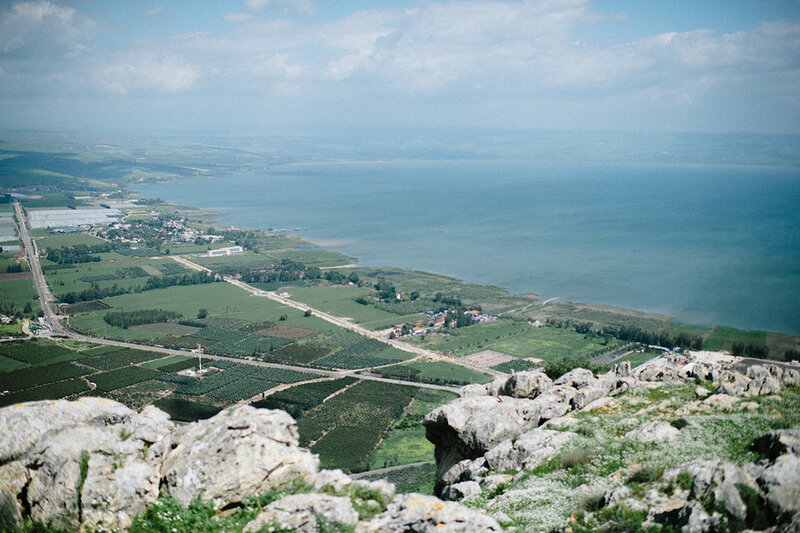 Overlooking the places and sea where so many critical events from the life of Christ occurred will always remind me of how blessed we were to live here. Because most of the hiking trails were closed, we made our way to the old synagogue right down the street and began our hike there. We hiked the 3 miles down to the Arab village at the base of the mountain. Remnants of the old synagogue at the start of our hike. It was built in the 4th century BC with just some pews and columns remaining. 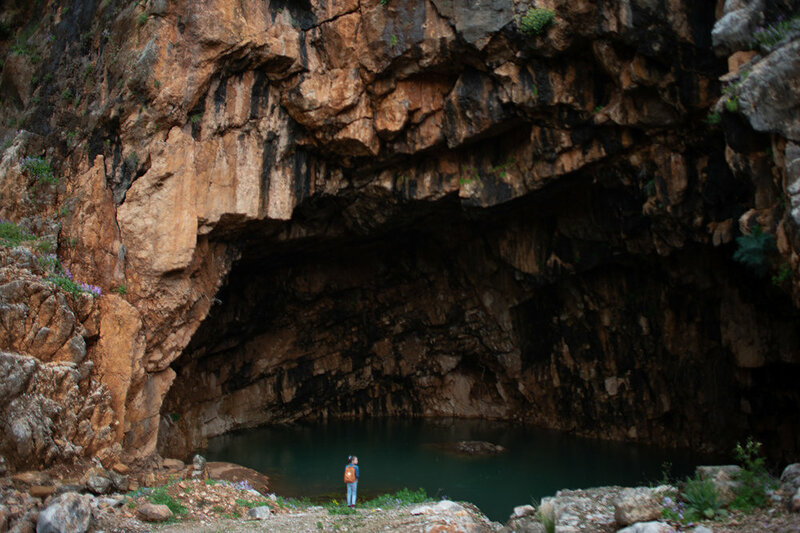 There are tons of cave dwellings from the Second Temple period in the area as well. We basically hiked this valley right here and had the best time. 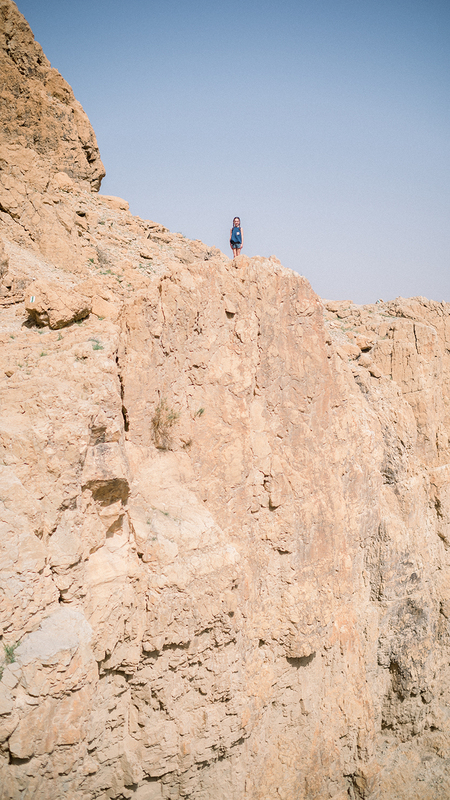 The sheer cliff on each side at the end of the hike had all of us in awe. Seriously rivaled the views of Switzerland at some points. Stunning. Tessa has recently discovered her love for hiking and basically had all of us running to keep up with her and Bella the entire 3 hour hike. Love her enthusiasm for challenging things. It makes the hike so much fun for me as a mother. The icing on the cake were all of these goats at the finish line. They were there with their shepherd and the kids loved them. They had the HUGEST ears we’ve ever seen. The only way to get back to our cars after the hike was to turn around and go back, which wasn’t going to work with our big crew and the hour of the day as well as a lack of water. So, we walked to a gas station and waited for the husbands to call a taxi and get our cars for us. It was such a beautiful day and I cannot recommend enough this hike and getting to the top of Mt. 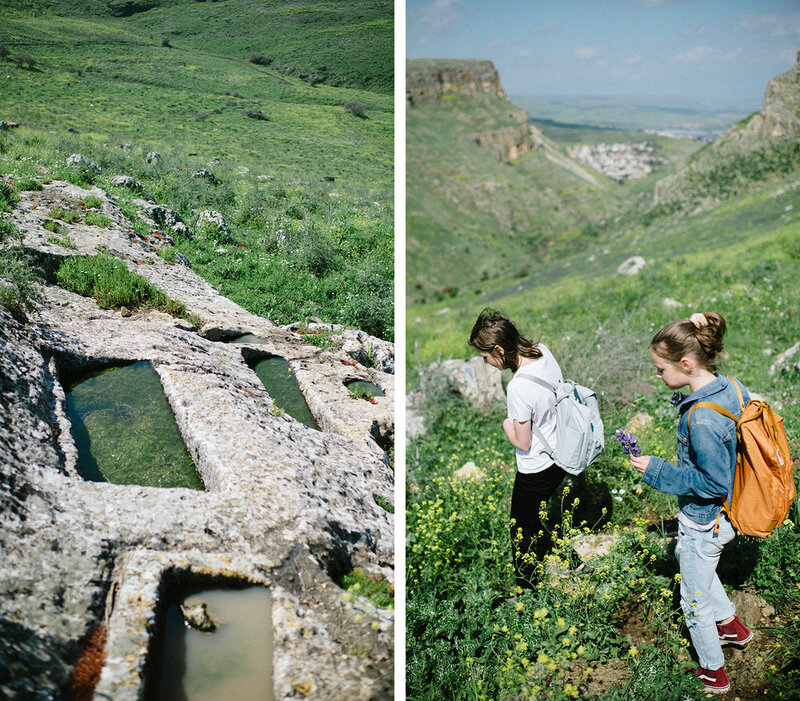 Arbel! Time for the most important part of our trip! 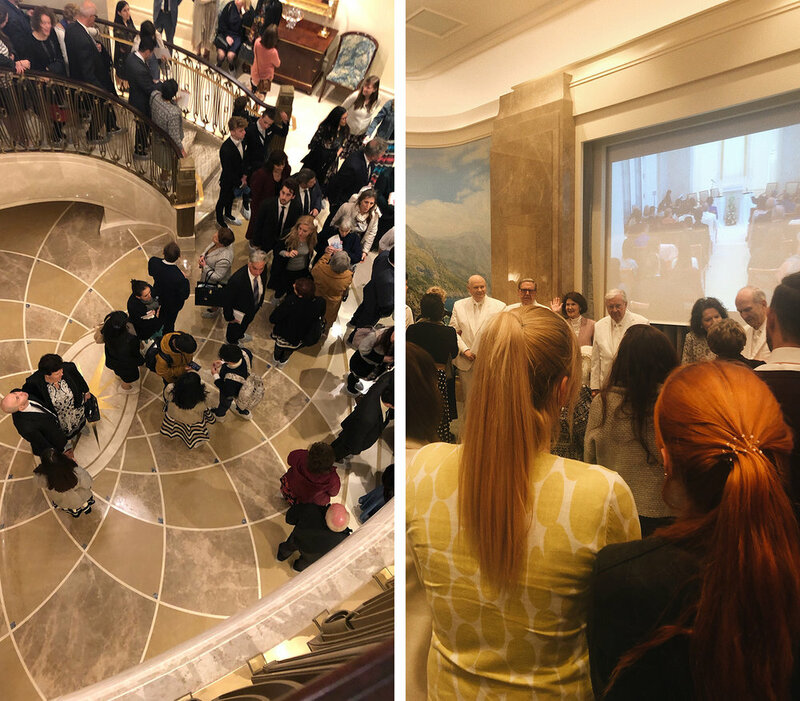 This temple dedication was historic in that it was the first time all 12 modern-day apostles had ever gathered at one time outside of Salt Lake City. President Nelson met with the Catholic Pope over the weekend and many apostles were seen throughout city at various historical sites as well. We kept crossing our fingers hoping that we’d run into one during our stay, but we never did. We had tickets to the afternoon session on Saturday so we made our way back to the temple (its about 6 miles outside of the city center). It was a cold and rainy day, so we had the kids wait inside the visitor’s center, across from the temple. Brian and I were able to go inside and find our seats and wait for the session (the second of 7 sessions) to begin. These pictures were taken after the session ended. I’m so glad we had time to walk the grounds, especially after hearing a little of the significance of this location and this building. There was a beautiful fountain that ran directly from the doors of the temple to the visitor’s center. From the temple, you can look up and see the glass windows of the center and the Christus statue as well as the statues of the original 12 Apostles in stunning arrangement. The structure of the temple itself is gorgeous too- it felt so surreal to be here with our girls on this special occasion. They were a little sad that they weren’t able to attend the dedication though. Brian and I had never been to a dedication and didn’t realize that all kids 8 years and older could come in as well, so we only applied for two tickets. I felt so badly that they didn’t have the chance to go inside too and now we are going to make sure we figure out how to get us all in the next chance we get to attend a dedication. We sure love these girls and feel so grateful for the knowledge that we get to spend eternity with our little family and all of those we love so much because of the work done in temples all over the world. So so grateful. I had the girls touch the walls with their own hands before we left. I hope they can feel the significance of the temple and desire to go inside one day for themselves. The interior of the Rome temple is beyond stunning. The artwork alone took our breath away- it was different than any artwork we’d seen in other temples we’ve been to and we tried to get a glance at as much as we could as we were shown to our seats. I hope we can come back here one day and get a much better look at everything. Brian and I were seated in the Telestial room where there were gorgeous murals of the rocky Italian coasts covering the walls. Right before our session began, President Nelson, Elder Holland, Elder Ballard and Elder Renlund as well as their amazing wives came in to our room to say hello. It was such a kind gesture and meant so much to see them in person. Each of the 3 Apostles there gave short talks before the Prophet spoke his dedicatory prayer over the temple. Their words were humble and powerful. Elder Renlund’s talk really spoke to Brian and I so I thought I would include a few points that I remember here. He relayed a story when his wife had cancer during the earlier years of their marriage. They had one small child at this point but the cancer had erased their dreams of having any more. They were both devastated and to make matters much worse, Sister Renlund’s prospects of surviving were rather slim. Elder Renlund said his prayers for her felt like they weren’t getting past the ceiling of the hospital and he was feeling very defeated. They were getting ready for their evening prayers at home and she was lying in bed, unable to even kneel down. Elder Renlund had asked her to offer the prayer so she began by giving thanks for the blessing of their family being sealed for eternity, no matter what the unpredictable future may hold. Elder Renlund, in that moment, felt relief and gratitude wash over him and from then on he felt healed and his prayers ascended higher than before. He quoted parts of Ezekiel 47 and the fountain of water that Ezekiel was shown flowing from the temple and how in its path, everything that it touched was healed. The prayer Sister Renlund offered had referenced the sealing ordinance performed in a temple and it had healed Elder Renlund’s feelings towards their difficult trial. In the same way that the waters of the temple had healed them, he promised that anyone who attended the temple would experience the same in their own lives and specific trials. Interestingly, there is an actual fountain coming from the Rome temple that was meant to mirror this vision in Ezekiel and I loved seeing it through new eyes after the dedication. The Christus and 12 Apostle statues were gorgeous and so were the murals on the walls behind them. Wow. I could have stared at them all day long. Below is the cross-section of the interior of the Rome temple- so cool to see all of it right here in miniature. We also took a few moments to walk on the grounds surrounding the temple. The greenery and gardens are always top-notch and we tried our best to soak it in. The side view of the temple it so beautiful too- it has a different look than the front and is really just so beautiful. Love this picture for a lot of reasons. My girls have been witness to a spectacular array of religious devotion in the past 6 months. I love that Tel Aviv has allowed them to see the Jewish and Muslim side and even the Christian perspective on so many occasions, but Rome is also full of the same devotion as it is commonplace to see nuns and/or priests walking the streets all over. The peace seen on this nun’s face is comforting and helps you realize the fulfillment one can feel when you center your life on Christ. I really admire those who literally devote their entire lives to serving Him and bringing the gospel to those who need it. The Pantheon is definitely one of the most spectacular sights in Rome. Ahh. The massive scale of this structure with its oculus is incredible, especially when you consider its construction in 126 AD! The Trevi Fountain on a sunny day…gorgeous. We made our way to the market at Campo de’ Fiori where we grabbed a couple of souvenirs as well as some much-needed lunch. There are not many things I love more than a local outdoor market. These two best friends are the best. I love watching them love on each other. 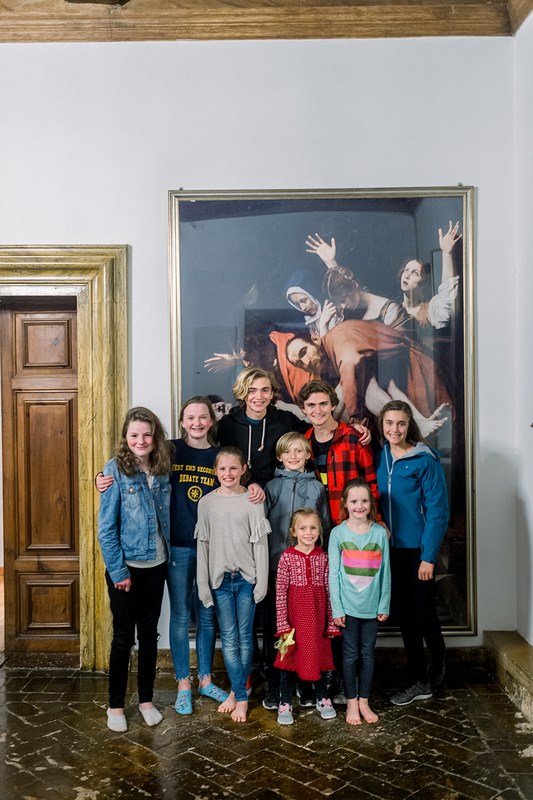 We met the Daltons at the Il Vittoriano on Saturday evening. It was so fun to see them again and have our kids get to know each other. We were so impressed with their sweet kiddos and loved how much fun all of the pre-teens/teenagers had hanging out for a few hours. We let them all hang out at our airbnb while the parents and their oldest son grabbed dinner nearby. We left for Tel Aviv early Monday morning. I have to say we were so sad to leave this amazing city but so grateful for the memories and new experiences we had here. One of Brian’s co-workers has a friend that is an Israeli reserve fighter pilot. She organized a trip for us to visit her base and check out some of her jets ;). It was so cool. Even cooler that we were armed with some extra questions after Hamas bombs dropped in Tel Aviv a couple of days before this. 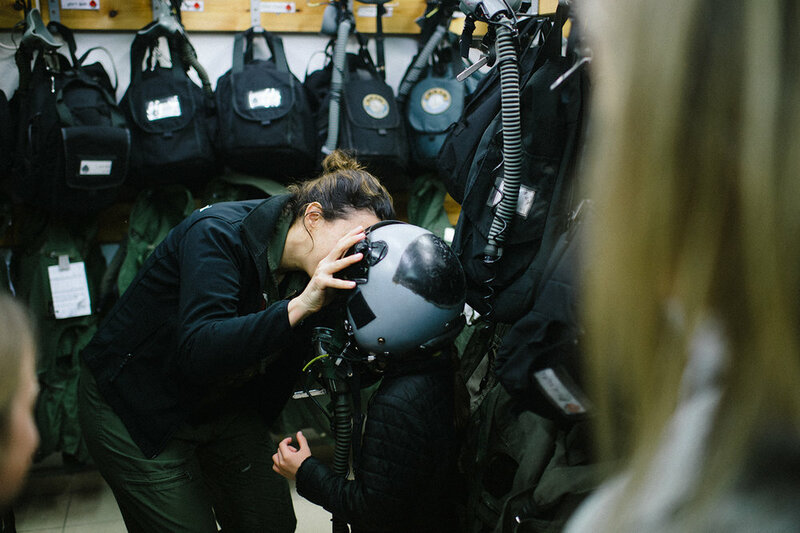 After seeing some videos of drills they run, history of their unit and even some real videos of bombs they’ve shot into enemy territory, we were able to see some of the gear the pilots wear during flights. Tessa and Lauren loved trying on these heavy helmets and it was so funny to see these huge things on their tiny bodies. Haha. So cute. Tessa- future fighter pilot with that serious pose. She (who didn’t allow us to take a picture of her face, understandably) also showed us the F-16’s that she has flown and are currently in use by the IDF. We got to climb to the cockpit and practically get inside- it was awesome. Forgot that Taylor tried this helmet on too. Clearly she enjoyed it. 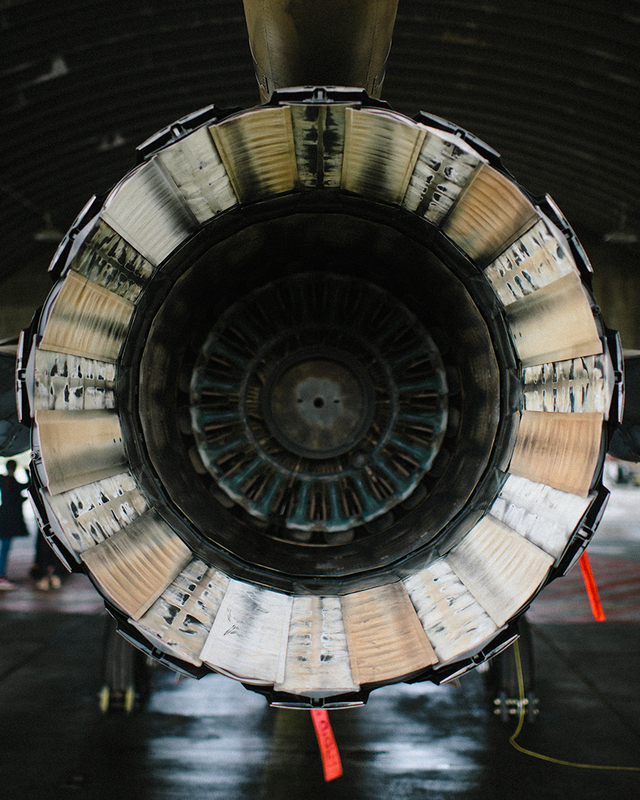 Battle-ready F-16’s right here for your enjoyment. Really so glad we got to do this. We cannot sum up our time in Israel without mentioning what a big part Carmel Market played in it. We got almost all of our groceries in this bustling open-air market with its crazy vendors and dirt-covered produce. Oh, and the best strawberries we’ve ever had. Plus, some of our favorite cafes. (Yom Tov 30, Shmuel, Ning Thai to name our top 3). I went here at least twice a week to get my beef fresh-ground on the spot at one store, another for my freshly butchered chicken, fresh cheeses at another, fresh bread at the bakery and produce at about 5 different places (I got pretty good at figuring out the best prices and the best quality and went to many different vendors depending on what I needed that visit). It was a totally crazy shopping experience, but one I will never forget. I loved that they called me “the American” and would give my girls free strawberries or bread when they came because they loved little girls. I used to walk all of my groceries home (it was about a 15 minute walk) and then that got to be too much so I got smart and bought a granny cart or would often hang the bags off of the handles of the electric scooter on the way home. Things got crazy, but those are things that are indelibly marked in my memory when I think of our time here. When a temple was announced in Rome in 2008, I, along with probably every other member of the Church of Jesus Christ of Latter-Day Saints imagined being there when it was finished and dedicated. That was 3 months before Lauren was born and an entire lifetime ago. Fast forward past Tessa’s birth in Texas, our move to London about 2 1/2 years later, a couple of years in Manhattan and then living in Tel Aviv where we are actually in the district for the Rome temple during its completion! Each of those cities we lived in was a specific launching pad to the next place and the next place that eventually brought us this close to Rome and the new temple. While we knew the chances of getting tickets to the dedication were decidedly small, we went for it anyways. When Brian opened the email on Shabbat, right before we left for church and it read that we had been granted tickets inside the temple, we both felt incredibly humbled for the blessing we had just been given and the chain of events that brought us here in our lives. We bought plane tickets that day for our entire family and the excitement began to set in. We woke up early- 3 AM- for our flight to Rome with all six of us. 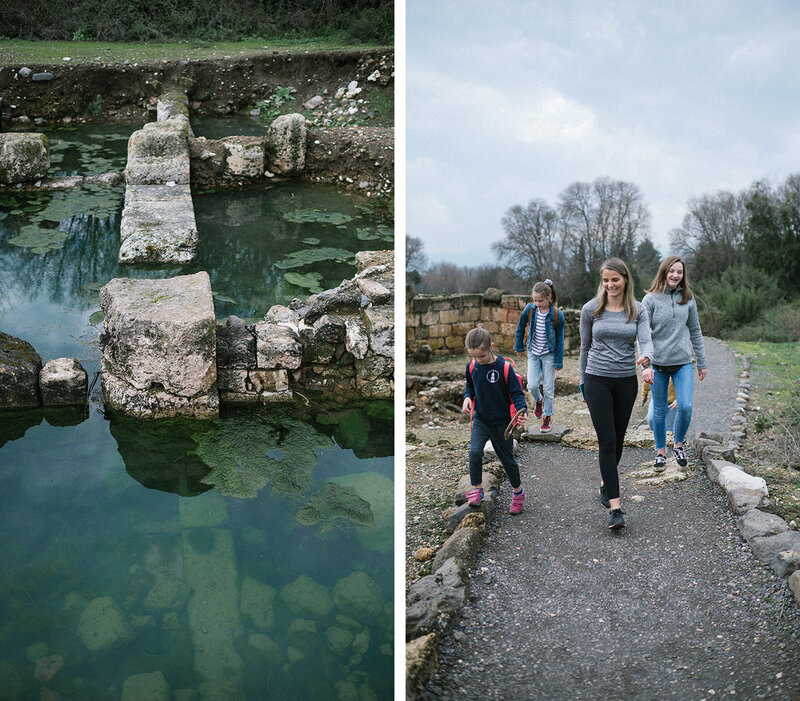 When we touched down in Italy, I immediately felt a sense of relief and stress leaving me. It was the strangest feeling- one that I certainly had not anticipated. I can only attribute it to the underlying tension that always exists in Israel- it is tangible enough that leaving the country makes you feel it. We arrived early (9 AM) and way too early to check into our Airbnb, so we did one of the things we were most looking forward to…eating good food that involved pork products (hey, you don’t know you need it until you cannot have it!). We lugged our carry-ons all over and settled on a cute cafe right off the Piazza Navona and very close to where we were staying. They even granted us an early check-in, so we didn’t mind killing a little time over ham and cheese sandwiches, pizza with bacon and some light touristing in this gorgeous place while we waited to ditch our bags. I think everyone was on cloud nine at this point because Rome is stunning and we could feel the excitement of our upcoming adventure in this very beautiful part of the world. Our Airbnb, below, was an old palace and the rental home of an antique collector. It was gorgeous and in the absolute best location. We loved it. A stunning and huge print of Caravaggio’s “The Entombment of Christ” was in the entry and so awe-inspiring to see every time we walked through the door. Trying to capture the beautiful place with its massive marble-encased doors, brick-paved floors and old fireplaces throughout. Such a fun difference from our modern apartment in Tel Aviv. Gelato at 10 AM? When in Rome! We hung out at the Piazza Navona after eating a quick snack and took in this amazing place. Ever since Brian surprised me with a birthday trip here 3 years ago (can’t believe how fast that time flew!! 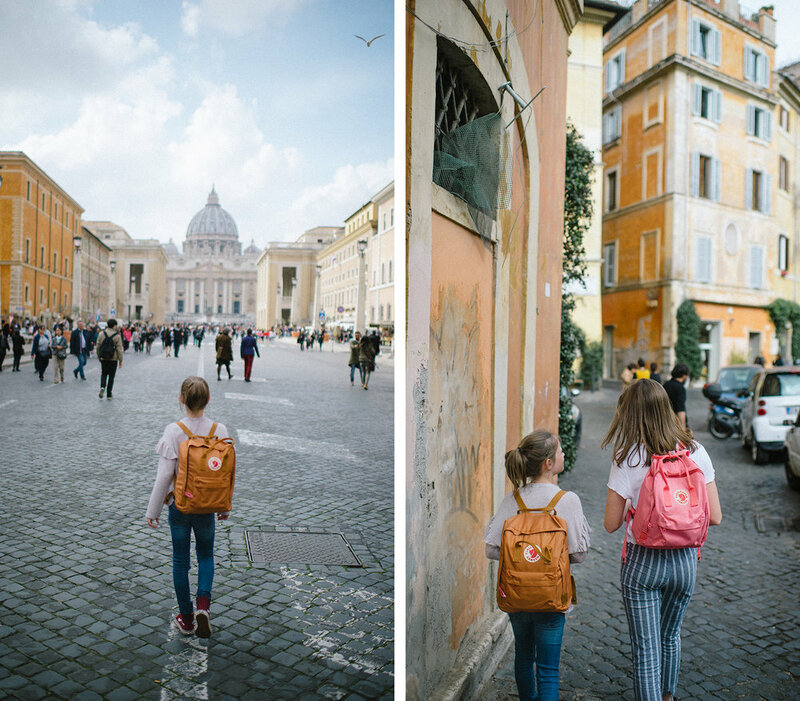 ), Rome has been one of my most favorite cities ever and I could see the same spark in my girls’ eyes as they saw it too. The colors on the buildings, the amazing food, the narrow cobble-stone streets and the doors of Rome….these are a few of my favorite things! Cannot ever get old to me. We all kept asking ourselves when we could move here! We stopped at the Trevi Fountain first and then a quick pit-stop at the Magnum store where you can make your own custom Magnum bar- so fun! They had the same pop-up Magnum store in NYC a couple of summers ago and I remember taking Lauren and Tessa with my sister-in-law, Amy, and her cute boys when they lived by us for a month. Awww, so many good memories. I’m off sugar at the moment and doing a challenge with my twin sister, Rebecca until the end of May so I just enjoyed watching my kids eating all of the things that made them so happy. I do say, though, that there is a good/better/best gelato ranking in Rome and we stayed near a “best”, Gelateria del Teatro. If you’re in Rome, you must go here! From Trevi Fountain, we stopped at the Pantheon and eventually made our way to the Vatican. We didn’t have time to go inside (its a very slow tourist-filled 3 mile walk from the entrance to the Sistine Chapel!) so we decided to hang out and take it in from the outside this time around. We scheduled a cooking class for late afternoon- the girls chose between that and a bike tour for this trip because it was such a short stay. I had done a bit of research on cooking classes and landed on this highly-reviewed option and were so glad we did it! It is called “Cook with us in Rome” and it is run by Cesare and Gianni. This is Cesare and he was awesome! The entire class was so thoughtfully put together and entertaining- which we needed because at this point, we were all hitting our walls from the time change as well as getting up so early! We made a huge menu of fried zucchini flowers and sage leaves, steamed artichokes, two types of pasta (cavatelli and fettucine) and two sauces to adorn those pastas- goat cheese with broccoli as well as a tomato sauce that simmered for two hours. The dessert was a tiramisu or strawberries with balsamic and sugar. Wow- everything tasted incredible! This is us preparing the artichokes for a flash fry and then finished off with an olive oil and water steaming. I loved learning all of these new-to-me techniques and watching my girls in the process. Our favorite part of the night had to be making this cavatelli pasta. The recipe was incredibly easy- just semolina flour and water, but the most satisfying part was rolling it out on these little wooden grooved paddles. It may have been so satisfying that Lauren almost fell asleep- haha! She was so zoned out (below) working off only a few hours of sleep. How beautiful is this pasta!?! Never thought I’d hear myself say that, but its so true. Can’t wait to make it again- Cesare sent each of us home with our own paddles so we could do just that. 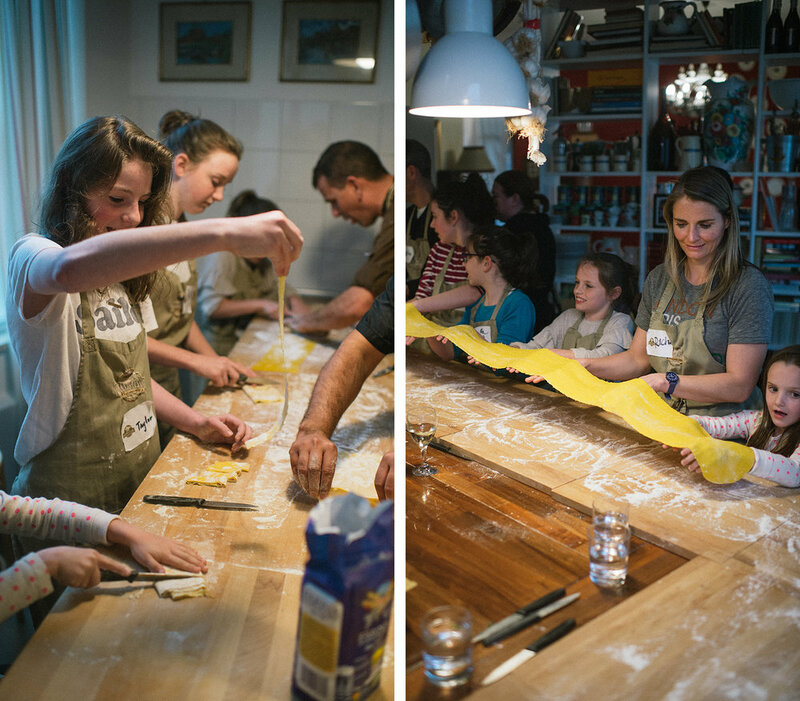 And then this process of making fettuccine had us all laughing. We had to run and “catch” it as it came out of the pasta machine and it came out so thin and long that it took everyone in the class to help. By the craziest coincidence, we had the nicest family in our class with just girls as well, and from Raleigh, NC. How crazy is that?? It was so fun to hear about their life in the city we land in next and they just love living there, so it got us all excited to be there soon. Above is the tomatoes that we first cut up and made up the two-hour tomato sauce that was unbelievably packed with flavor. We all took turns stirring it every 10 minutes. Three ingredients- garlic, olive oil and tomatoes and add time and you get something that blows you away with flavor. The sauce eventually adorned our fettuccine, but I probably could’ve drank it with a straw. Oh, Rome. You are the best. This city delivers in a huge way and its like a living museum with its ancient ruins sprinkled all over. If we ever lived here, we’d never survive in a big car. We’d sooner squish into a tiny car than try to squish a big car into these tiny streets. It would be worth the charm though- I wouldn’t trade these streets for anything resembling a highway. Day One involved an unusually large amount of Coke zero (for me) and Haribo gummies (for everyone else). World’s best gummies that were everywhere. Ah, the live music playing in the various piazzas around where we were staying (and probably in every corner of Rome) made me so happy. Add beautiful music to any setting and I could sit and bask in it forever. I’m so smitten over this place. I love awesome coincidences and running into this family right here was one of them. There was a youth fireside at the Rome temple and because there was no public announcement made about the time, we guessed it would be around 7 PM. We arrived in our uber at 6:30 to find out that it had just ended! :( As we were getting out of our car, we ran into the Dalton’s. Mike and Brynne are dear friends of my sister, Jessica and her husband as well as neighbors to our friends, the Pothier’s, so we’ve heard so much about their family. While I recognized them, they had no idea who we were so when I got out of the car and said “Hello Daltons!”, they were definitely confused. :) I explained the connection and we chatted for a few minutes before they got in our uber for their ride back to Rome. It was so fun to make the connection and we met up for dinner in the city the next evening. 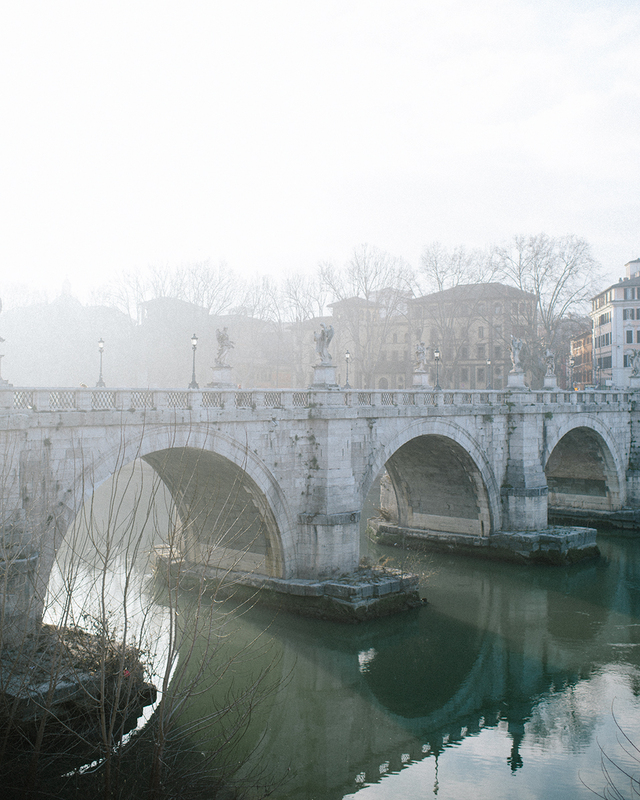 The foggy, magical mornings and bridges of Rome are one more reason to love it. Still trying to think of some reasons not to love Rome- can’t come up with any! Lauren and I went on a run one morning together to Trastevere and we felt like the only ones out. Next up: Rome temple dedication and the reason for our trip. It was so fun to have these friends reunited. Especially for our kids, who have been missing friends so much since leaving the city. We stayed up wayyy too late talking and catching up. The next day was a slower day where we all slept in and played on the beach here in Tel Aviv. On Saturday we got up early to attend church in the BYU Jerusalem Center together. This is a magical place to show friends and family- the views, the feelings, the entire place is just something else. After church, we took some pictures out on the lawn overlooking the Old City. It was really really cold. We love their kids not only because they’re so great, but they have so much fun hanging out and playing (til the wee hours of the morning, even) with our girls. The entire week was pretty much a non-stop party. After church, we headed to the Garden of Gethsemane. Probably the most special place in all of Jerusalem and what’s more is that the flowers were blooming and everything had greened up spectacularly. I love these red poppies (which I later learned are the actual Lilies of the Field). Some scenes (below) from our Friday beach day. Deborah and I went on a gorgeous run all the way to Jaffa and back and then met these crazy swimsuit-clad kids on the beach in front of our building. It was chilly out, but they were intent on getting in the water no matter what. And they did. We also played several rounds of family-style volleyball (no spiking, catching the ball and then lobbing it over, etc) so everyone could do it and we all had so much fun. Ok, this doesn’t really resemble the actual game of volleyball. But, its almost better because everyone can play no matter the age. We just had the best time playing for hours on the beach.